In Chicago, winter is as dependably terrible as the Bears' offensive line and the corruption scandals of local aldermen. Experienced Chicagoans are well aware of this, and know that the secret to surviving until spring is plenty of booze and a cozy local spot with a warm fireplace. 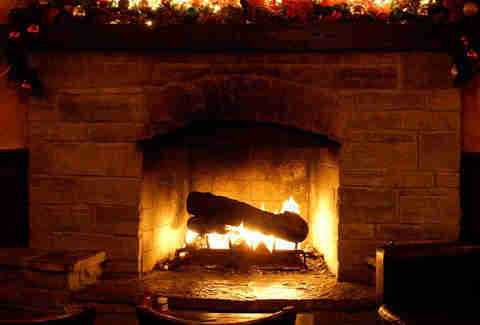 Therefore, we've compiled a list of the best fireplace-equipped drinking spots in town, ranked from No. 20 to No. 1, so you're never caught drinking at No. 21. Gross. 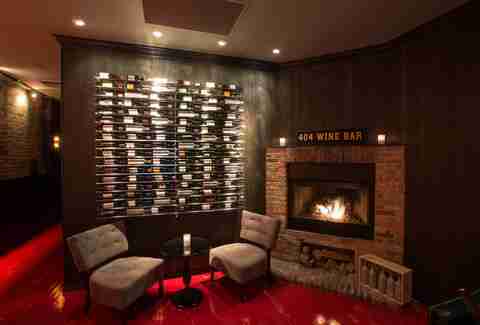 A top-notch date spot, ENO wine bar boasts a cozy aquarium fireplace and a varied menu that will impress anyone who’s into wine, cheese, chocolate, or all of the above. And if your date isn’t into wine, cheese, or chocolate, then you should probably ask yourself what kind of person isn’t into wine, cheese, or chocolate. Because chances are they're probably a time-traveling cyborg sent to destroy you and stop your unborn son from saving humanity in the robot wars of the future. Watch your back. Or maybe just find another date. There are few sure bets in life, but there's no denying that: 1) Everyone loves pizza, and 2) Sitting next to a fire ensures that you won't be attacked by an army of gigantiops destructor ants. Fortunately, you can do both of those things at Stella Barra Pizzeria, which offers tasty pies with toppings such as smoked bacon and goat cheese, or avocado and arugula pesto. 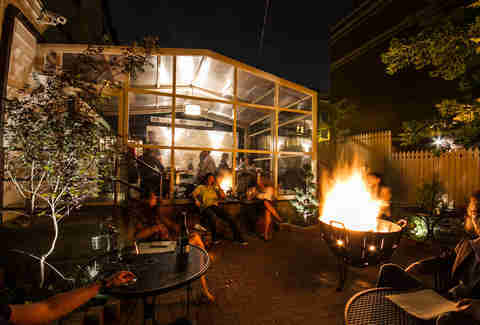 The “fireplace” at Table, Donkey and Stick is actually a fire pit, but it still makes it a great spot to visit because one can step outside and warm up on a chilly winter eve. It also works well with the overall theme of Table, Donkey and Stick, which prepares rustic mountain-fare inspired by the hearty folk of the Alps. As a bonus, stop by on Mondays for $0.99 High Lifes, $3 whiskey shots, and 25% off charcuterie. 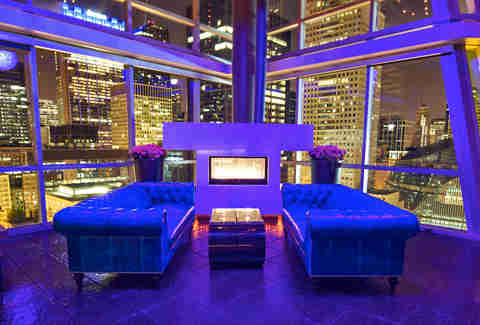 The fancy rooftop lounge located atop the LondonHouse hotel is usually off-limits during the colder months, but visitors will still find an elegant indoor bar located on the 21st floor. 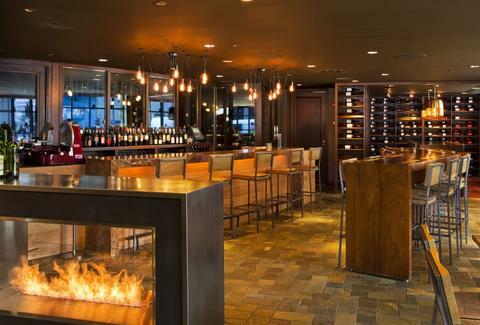 Post up next to the aquarium fireplace and unwind with a stiff drink off the menu, which includes bottled cocktails, cocktails on tap, and group-ready decanter cocktails that serve four people. Besides its stone fireplace, Grafton has plenty of other reasons to visit. Hungry? The kitchen whips up hearty eats such as a shepherd’s pie and fish and chips. Thirsty? The pub has a nice selection of whiskey, wine, and beer. Do you work in a quiet library, or a lighthouse, or a lighthouse library? Grafton hosts live music throughout the week, so your ears can get massaged by the soothing sounds of Irish folk tunes. Much better than seagulls. Maybe skyline views, high-energy day parties, and leggy models voguing down a table-slash-runway isn’t your idea of “cozy.” But take one look at that stunning fireplace-setup and tell us you wouldn’t trade the shirt off your back for a reservation. Score a seat and order up a snappy El Diablo cocktail, made with Don Julio reposado tequila, St. George raspberry liqueur, lime, and ginger beer. This slick new Bucktown spot not only offers a solid 4am option for late-night revelers, it's also a comfy hangout where visitors can order a cocktail and become hypnotized by the massive fish tank located behind the bar. The fireplace adds to the chill vibe, and comes in handy if you tend to lug around a pointy stick and bag of marshmallows when you go out. RM Champagne Salon is classier than a man who doesn't wear sweatpants to Old Country Buffet, so it should be no surprise that it has an elegant fireplace that burns real wood. Order up a great bottle of Champagne and you'll be lounging like a monocle-toting railroad tycoon in no time. 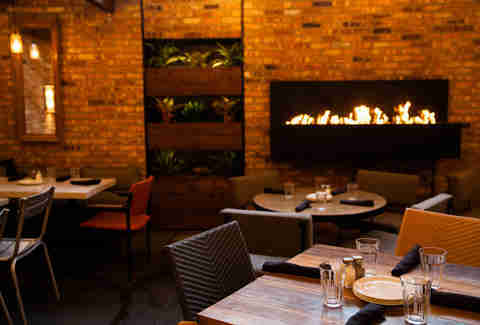 Cantina Laredo boasts three fireplaces, including one that's located inside a wall in the dining room. It looks like something a Bond villain would have in his Arctic hideout, but for epic lounging, we prefer the one located in the upstairs lounge. 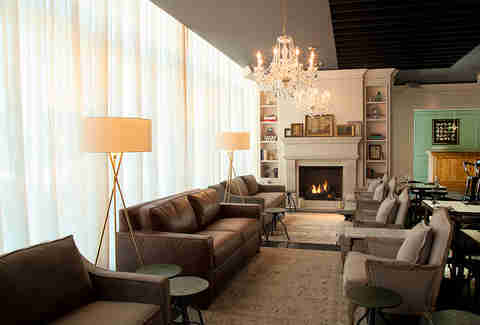 It's a great spot to warm up while checking out bustling River North below and also keeping prowling polar bears at bay. 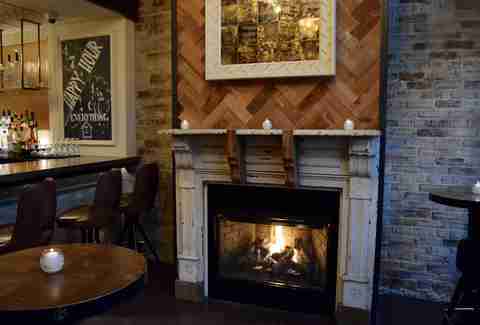 This cozy Avondale pub not only boasts a roomy patio that's perfect for summer lounging, it's also a great wintertime hang that will warm you up when the climate outside rivals that of the ice planet Hoth. Order up some rib-sticking pub eats with a Guinness, and kick back while the calories form a protective layer around your winter-worn body. Massive wine selection? Check. 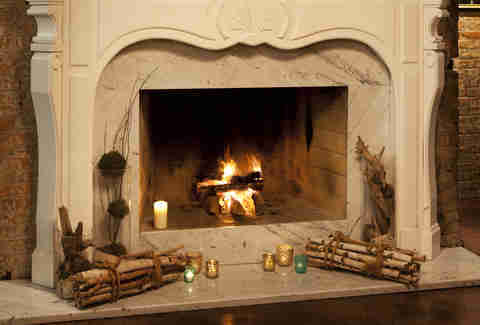 Wood-burning fireplace? Check. A special room where you can smash bottles against a wall for fun? Well, not really, but perhaps some day! Until then, kick back with a glass of fine merlot while warming up next to the fire and swearing to never purchase boxed wine again. 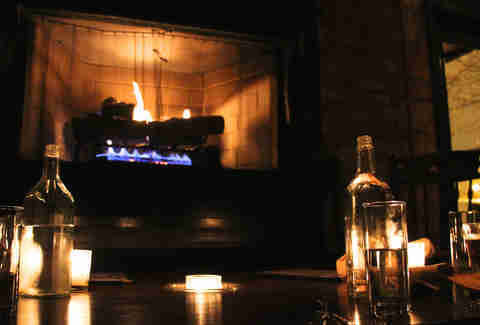 When it comes to Scofflaw, come for the excellent cocktails, stay for the tasty kitchen offerings, stay even longer for the free cookies that are passed out at midnight, and then beg the staff to spend the night beside the warm fireplace because you’re convinced you’ll never make it home in the soul-crushing snow. Hey, it’s worth a shot. For a restaurant that serves up entire wild boars, goats, and alligators, one fireplace simply will not do. 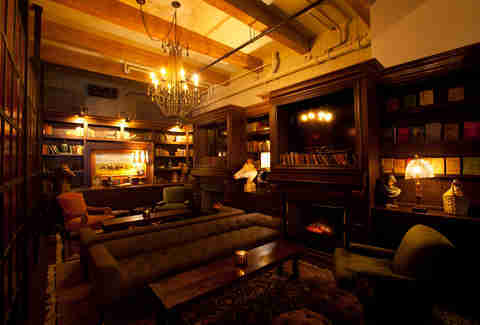 Hence, Frontier offers spots to warm up upstairs in its elixir room, as well as on the year-round patio. 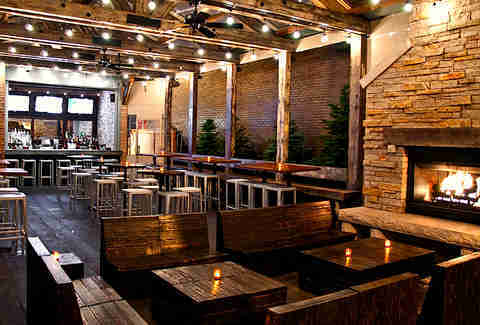 The décor is heavy on the exposed brick and stained woods, making each visit feel like a trip to some mountain lodge. Specifically, a mountain where alligators roam and it’s OK to eat them. 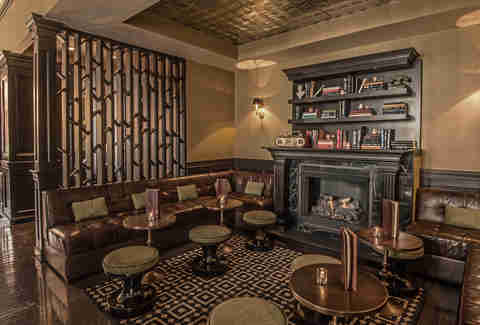 Reminiscent of a historic London haunt, Wilde Bar & Restaurant has rows of books covering its walls -- which not only looks cool, but serves as a protective barrier against ghosts. (True!) 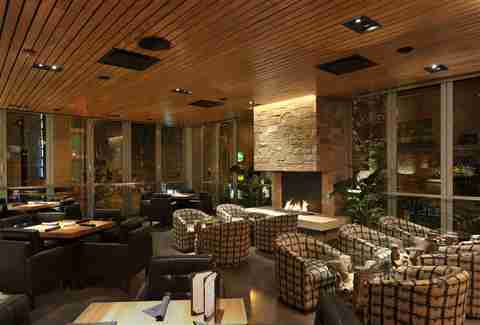 It's one of the coziest joints in town, best enjoyed on a blustery winter night while lounging in a roomy booth or a sofa chair perched next to the fire. Moody’s probably looks as medieval today as the day it opened in 1959 (or is it 1459? ), and we mean that as a compliment. 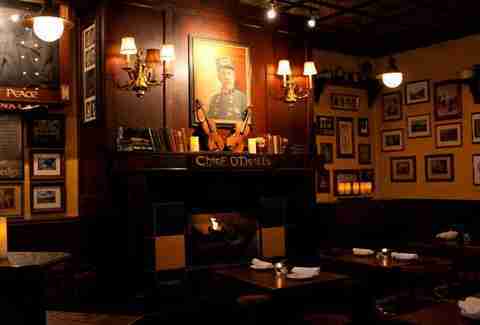 The Edgewater pub basically feels like a castle’s basement once the kitchen starts cooking up excellent burgers, the fireplace begins to roar, and the pitchers of sangria start flowing -- and fueling GREAT decisions. Serving accessible New American cuisine in a chic setting, Taus Authentic is an Instagram-friendly spot that's perfect for group meetups. You can't go wrong with ordering an Old & Peppered (Bulleit rye, black pepper simple syrup, Regan's Orange, Angostura) alongside a plate of lemon-honey butter fried chicken, but if you grab a seat next to the crackling fire and you may never leave. Stunning views. Elegant décor. Speakeasy vibe. Inventive drinks. (Such as the Ron Swanson, made with Buffalo Trace bourbon, Cynar, ancho chile, maple, soy, and Lagavulin rinse.) 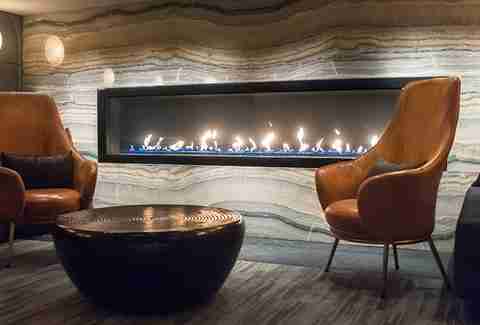 While Drumbar is a no-brainer destination spot in the summer, it also has plenty to offer in the winter thanks to its outdoor fire pits and a fireplace-lounge area that looks more inviting than plopping down on a bed of $100 bills. We're pretty sure it's entirely possible that at the Chicago Athletic Association, fidgeting with a lamp or book can lead to the opening of a secret passage that will reveal skeletons and long-lost treasure. 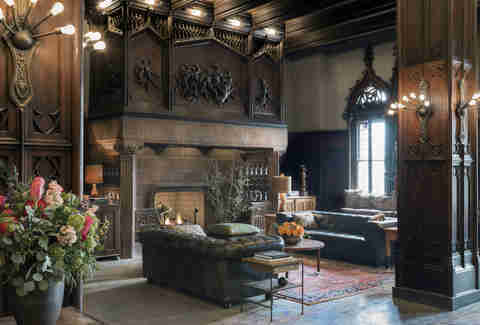 Until that happens, we'll be kicking back at the inviting Drawing Room, which has a downright majestic fireplace surrounded by a pair of tufted-leather couches. Hanging here almost makes winter enjoyable. Almost. 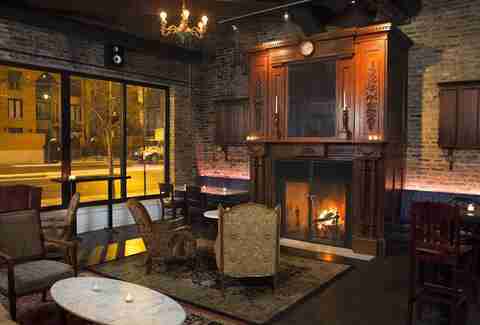 The elegant, clock-topped fireplace at Old Town Social looks like a fancy armoire that was picked up at Scrooge McDuck's estate sale, and we're totally into it. Clearly, this isn't just another sports bar where cheeseburger sliders are churned out at breakneck pace. There's plenty of good stuff on the menu here, but we recommend the excellent charcuterie, which is made in-house with local ingredients. Hubbard Inn bills itself as a Hemingway-inspired restobar, and features classic dinner-club décor complete with tufted sofas and stocked bookshelves. However, it’s also imperative that Hubbard Inn keeps its bar well-stocked, since Hemingway drank like a storm drain in a typhoon. 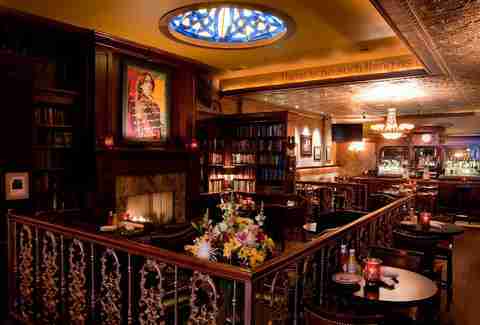 The establishment actually offers two separate fireplace lounges on two floors, both of which are great spots to enjoy a dry martini -- a favorite of Ernest's. Raf always stares into the fire, because the night is dark and full of terrors. Hit him up at @RafFoSho.